The top chess photographer David Llada took some time of his busy schedule to speak with Chessdom’s editor GM Marian Petrov about “The Thinkers”, chess photography, and his future plans. Marian Petrov: You have recently published a chess photography book “The Thinkers” and it is the hottest one on the shelves right now. Did you expect this success when you started? 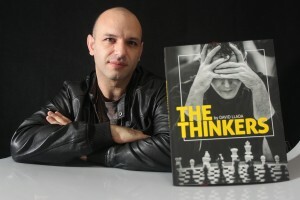 David Llada: Let’s say it is a relative success because it is not at all the best-selling book that Quality Chess has published! But, having said that, I think both the publishers and I are very satisfied, “The Thinkers” already overcame our expectations. We managed to create something truly beautiful and original, that many people will treasure. And I am very surprised by the welcome it had, not within the chess community, but in general media. It has been reviewed by big names like Wired, First Post, and several photography journals, bringing chess to a wider audience. MP: How did you get in chess in the first place? MP: What triggered you to become a chess photograph? DL” Observation and adaptability. I quit my career as full-time chess journalist around 2004, but I was missing my friends, the trips, and the excitement of chess tournaments. I started to visit some events in a more casual way, just to see my friends, take a few photos… then I noticed two things: one, that photography could allow me to keep a flexible connection with chess, compatible with my day-by-day job. And two, that we lacked good photos in chess, so if I improved enough I could still contribute to the promotion of chess with my pictures. I realized I had an opportunity. MP: When did the idea about The Thinkers started to take shape? DL: Very soon. Lets say I started taking photos a bit more seriously in 2012, and by 2014, after having the chance to attend several events in a row, I finally reached the level I wanted and developed the style I had envisioned. So in September that year, shortly after the Tromso Olympiad, I announced my plans to prepare a book and a photo exhibition. Then it took some time to make it happen. First because I had to write another book that I hadn’t planned: a manual on how to teach chess, for parents and educators, published by one of the largest publishing houses in Spain. Then, I turned down a few early proposals to publish “The Thinkers” because I wanted to make it perfect and I didn’t mind to wait until I found the right publisher at the right time. I am a bit picky and demanding when it comes to professionalism. And I was lucky I had the chance to come across Quality Chess. They gave me all the freedom in the world to put together the book I wanted to, but at the same time I could rely on their experience and guidance in the moments when it was needed. MP: Do you have favorite photo inside the book? DL: I don’t like to be asked about my favorite photo because I simply can’t choose. But if you ask me about “my favorite photo in the book”, the task simplifies: there is only one photo of one of my daughters, playing her very first tournament. That is of course my favorite. MP: Being a chess photographer you go all around the world. What are your future plans? DL. My next goal is to turn “The Thinkers” into a traveling exhibition. I am planning to print the best photos in huge sheets of aluminum composite, so I can send them around the world, from one event to another, from one gallery here to one gallery there. That’s my plan to give the beautiful game of chess the visibility it deserves. And that way, my photos would do most of the traveling for me, while I can stay at home enjoying my chess books. Quality Chess offers me now a massive discount on all their products, so work is piling up! DL: Yes, there are. Many. Almost no one on his mind would copy somebody’s else article, word by word, and publish it on their website, not even mentioning the original author. However, with photography, they do this all the time. It puzzles me because, after all, anyone can write a good article or tournament report from the commodity of their home, but in order to take a picture, you have to be on the spot. Somebody has to pay for flights, hotels, and all the fancy and expensive photography gear that we use. And yet we receive much less respect and recognition. MP. Are you going to take action against those who use your photographs without permission? DL: I did, and I still do. In general, I content myself with a little protest, just firm enough to raise awareness. Most people does it by pure ignorance, but once they realize they’re doing something wrong, they change this habit. Others, however, are worse: they would resort to any excuse to justify what they do. MP: You have met many players, do you prefer to make pictures of the top players or amateurs? DL: I was a bit bored of going to elite tournaments, where you see always the same faces over and over again. I prefer to go to large opens, with hundreds of people. Especially, in exotic places like Kenya, India… And I would also love to go to more children’s tournaments. MP: Are all people happy when you make pictures of them? DL: I think they are. Actually photography is very rewarding, specially if you compare it to being a reporter. Everybody loves to have a professional picture taken. However, when you write about someone, or you interview him, there is always some little thing they didn’t like, something they will complain about. Especially chess players! MP: Ten years ago chess players were not used to being taken photos before the games, they were even hiding from the cameras. This has changed now, is it because of the era of the smartphone or it is a gradual result of all chess photographers work? DL: There are several causes, I guess. The Soviet Union are long gone, so the days when the state was providing for you are over: now you need the press, you need the sponsors, and players are aware of that. Also, chess is now much more competitive, nobody feels so special anymore. There are no divas, or very few, because the gap between you and the next guy in the rating list is very small. Maybe he is nicer to the press, and maybe he will take your seat next time. So, no, they don’t avoid the cameras anymore. I would even say that, little by little, we get to see the opposite: they are getting interested into gaining exposure. MP: We are sure you have many anecdotes that happen during the tournaments. Can you share a funny story that is not widely known and can surprise our readers? DL: Sure I could, but I am afraid that the most juicy stories I am not allowed to tell! What happens out of the camera, stays out of the camera. MP: How can our readers find the link for The Thinkers? DL. There are two options: one is to buy directly from the publishers, Quality Chess. They are doing a great job with their books, they are very supportive with their authors, and the best way to support all this is to buy from them. The second option is to find out if your local chess distributor can get it for you: supporting the small business around us is always a good option too!